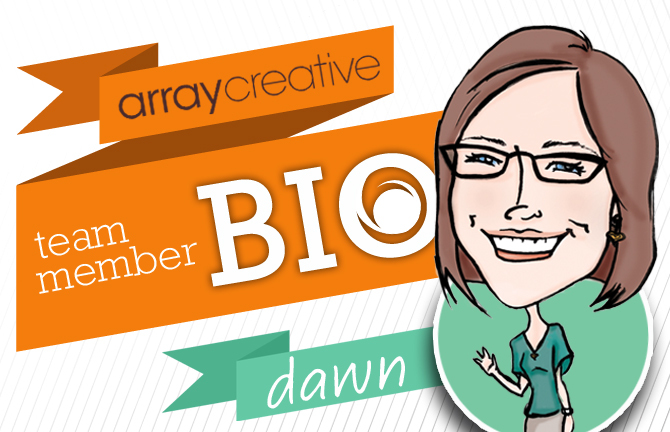 A native Akronite, Dawn joined the Array team just over a year ago. Bringing with her a Bachelor’s degree in graphic design from Kent State University and a plethora of design experience in packaging and branding, she has been a great addition to the team. After a day of whipping up some creative at the office, Dawn heads home to her hubby Stefan, two overly energetic little ones, and sleepy pup (who is usually hiding from said little ones). Without a doubt, the smell of hubby cooking bacon and eggs on Saturday mornings. A distant second would be the smell of freshly baked bread from the Schwebel’s factory as I drive by. Um, no. Let’s not speak of this again. My husband, Stefan. He claims to know me better than I know myself! Shake by Taylor Swift. I now need a Swiftervention. My daughter always tells me it’s green. I have no idea why. I do! Lately the challenge has been finding nutritious yet tasty dishes that the little ones will actually eat. Luckily, my husband will happily eat whatever I cook. We had a plentiful garden this year, so it was wonderful to pick our own fresh veggies! Most definitely Bacardi Orange and Fresca over ice. You just can’t go wrong with that! The hubby and I did a quick trip to Buffalo. We used to live there, so it was fun to relive some old memories! As we call it at home: “dippy-toast style”.